O and I are massive film buffs, opting for a Saturday night spent in the theater with a too-big popcorn and secret “outside food” snuck in with my mega-purse over anything else. Needless to say, the Oscars are a favorite of ours, as we debate each other on which film will win Best Picture and whether Matthew McConaughey deserves Best Actor considering his career development.. or if it should go to Chiwetel Ejiofor for his heartbreaking, captivating role in 12 Years a Slave. 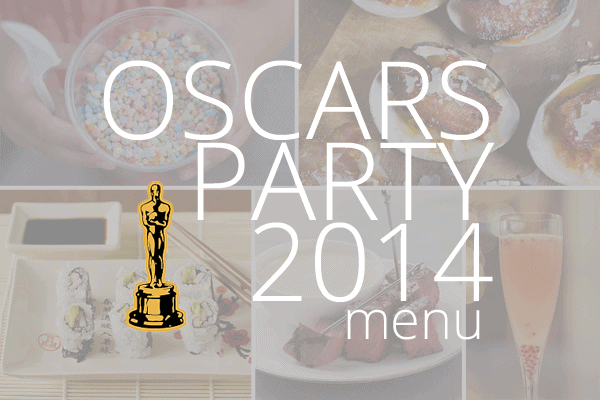 We’ve yet to actually start a couple’s bet, but we’re on the verge..
Diatribe aside, hosting an Oscars party can be the perfect way to spice up an otherwise blah late winter, and what could be more fun than creating an entertaining menu inspired by the Best Picture nominees? That’s exactly what I did for the accessories boutique Dazzle, and I wanted to share it with you! We’ve got kitschy and Italian options for American Hustle, a fun DIY bar for Nebraska, and some really space age grown-up fun for Gravity. Check out the whole list at Dazzle’s blog. And come back tomorrow for part two: accessories!